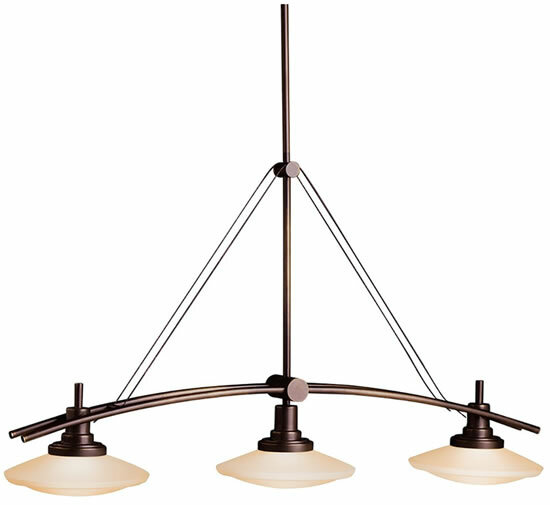 Width	9" x Length	37" x Height	21.5"
This 3 light linear chandelier from the Structures Collection proves that one style can take on numerous forms. 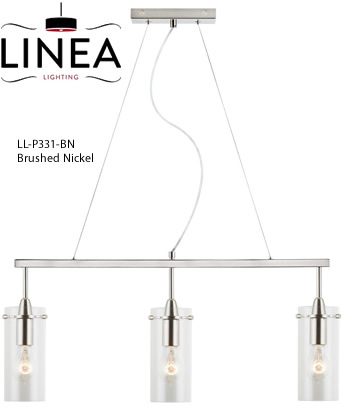 Brushed Nickel with White Satin Etched Glass Diffusers has a timeless, clean feel capable of matching any decor. 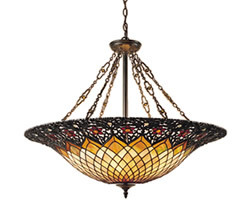 Olde Bronze with Light Umber Glass Diffusers brings an antique touch to the fixture. 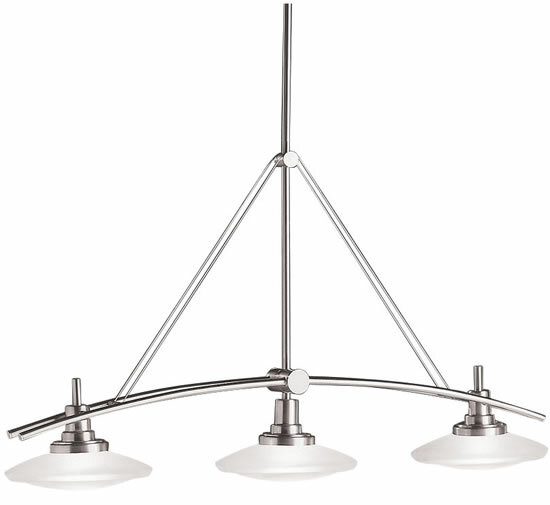 For a modern spin on the classic island light, the Structures Collection recommends this outstanding fixture whose clean, simple lines will highlight any decor. 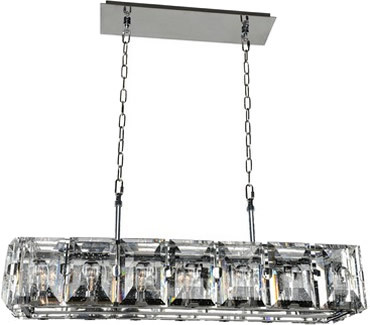 Width	9" x Length	47.5" x Height	21.5"
This 4 light halogen linear chandelier from the Structures™ collection proves that one style can take on numerous forms. 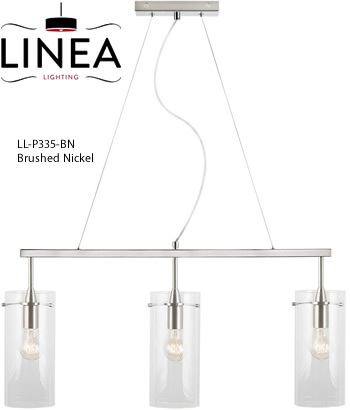 Featuring an elegant Brushed Nickel finish and Satin Etched Glass, this design is capable of unmatched versatility. 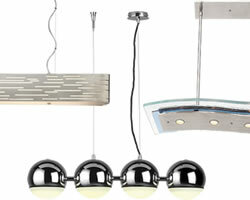 The Laguna Collection is a shimmering work of art designed by Toso, Massari & Associates (with G. Toso). Laguna has three decorative modes: Delta, Platinum and Canal. 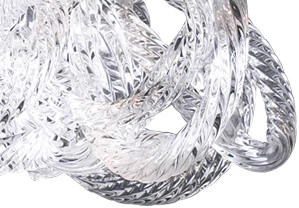 Each is stunning in their own way, and all are handmade by artisans in Italy. 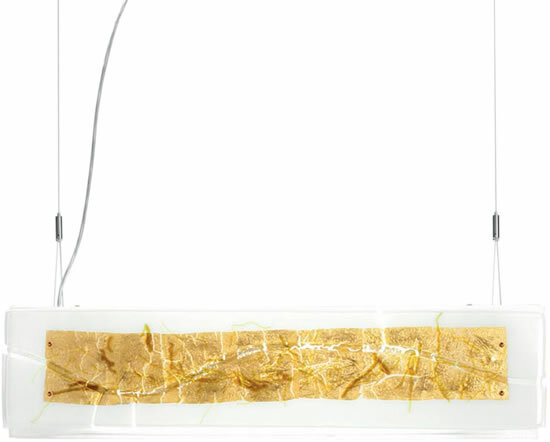 Delta is a square format that features a fractured panel of glass inlaid with colored glass shavings and gold leaf, which create both its distinctive artistic effect and flashing plays of light. Canal is a based on a similar concept, but in a long rectangular format. 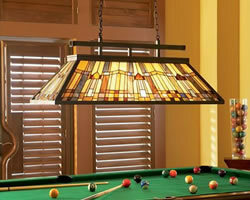 Both Delta and Canal are available with a white glass background or an amber glass background. 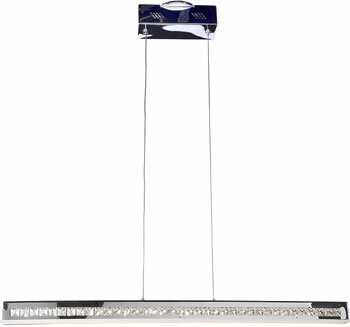 Platinum features a white glass diffuser accented with a platinum glass element as its focal point, which creates a stunning pattern and gleam. Dimensions: Length 31.5" x Height 13" x Width: 6.25"
Rods Included: 2 x 6" + 6 x 12"
Dimensions: Height 53" x Length 34" x Width 5"
Height adjusts from 22" to 53"
Add a touch of modern sophistication to your kitchen with the Effimero Three Light Island Fixture made by Linea di Liara. 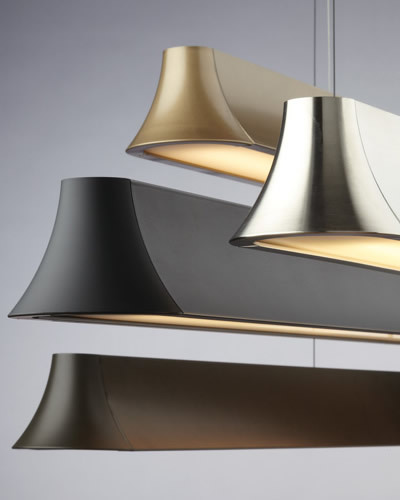 Designed to perfectly compliment Effimero pendants, the collection is available in a variety of finish options and glass types. 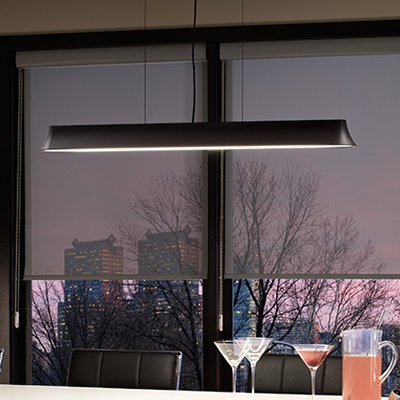 Effimero island lights feature clean lines and a contemporary silhouette that allows light to take center stage. Dimensions: W 32" H 2.6"
Overall Height 15 to 120"
Inspired by the sheen of big city st eets and intersections illuminated at night. 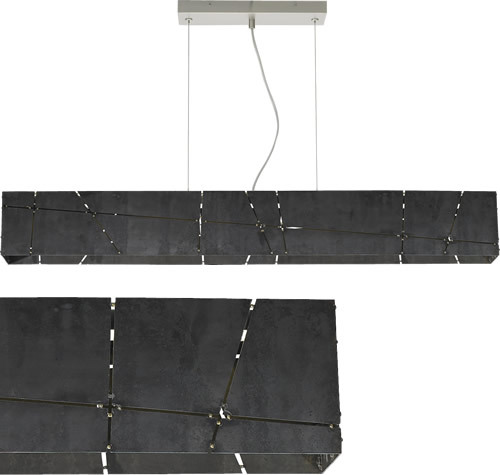 Composed of sheets of raw steel protected with a clear lacquer coat and accented by brass spot welding at the joints, this suspension fixtur e has a purposefully imperfect, rugged, industrial design. 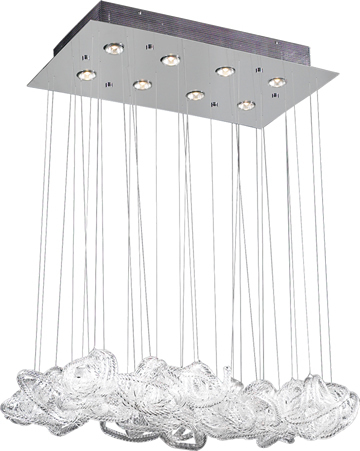 Includes four 120 volt, 40 watt G9 Halogen bi-pin lamps or two 20 watt, field-replaceable LED strips (3500 lumens, 3000K). 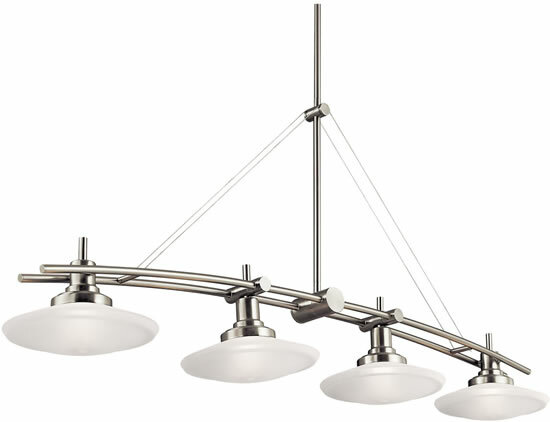 Halogen may also be lamped with four 120 volt, 60 watt G9 Halogen bi-pin lamps (not included). Ships with 21 feet of field-cuttable cord and twelve feet of aircraft cable. 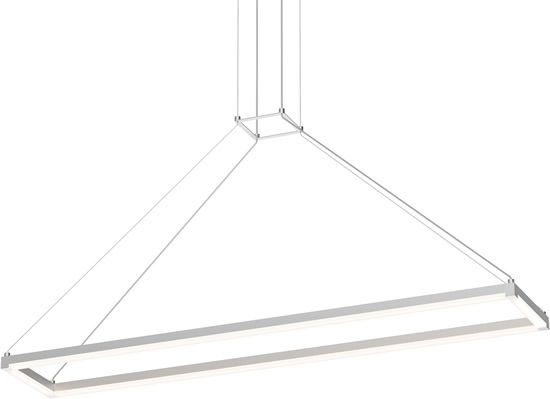 Incandescent version dimmable with standard Incandescent dimmer. LED dimmable with low-voltage electronic dimmer. 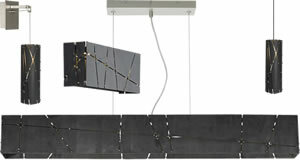 Height 1.5" x Width 30" x Depth 7.25"
LED Stix Square precisely arranged into a square-shaped mobile sculpture of illumination. 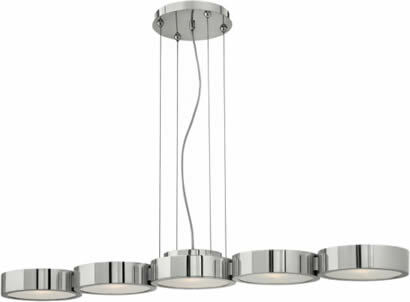 Height 1.5" x Width 47" x Depth 9.25"
This sleek contemporary cable hung collection in Polished Aluminum features low-profile circular light pods with etched glass diffusers. 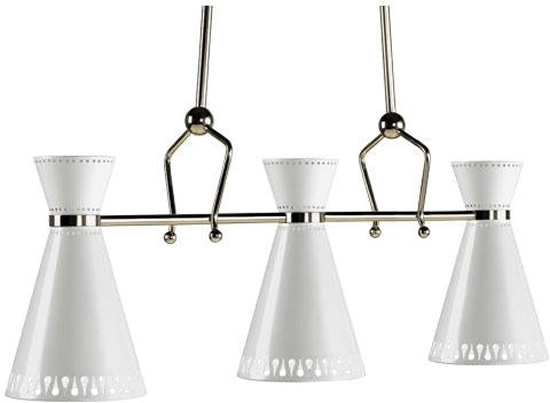 Detailed mesh up-light diffusers add sophistication to the chic design. Width 40.5" x Height 3.3"
Width 34" x Height 38"
Hard and soft lines converge in this elegantly simple silhouette equally suitable for both residential and commercial settings. A bottom acrylic diffuser provides a glare free wash of light. 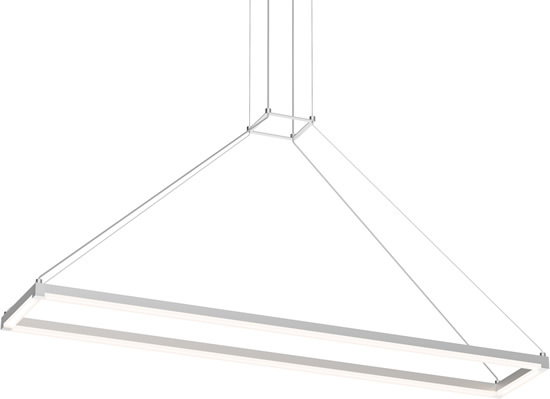 A highly reflective inner white housing and two high output Fluorescent lamps ensure this fixture performs as well as it looks. 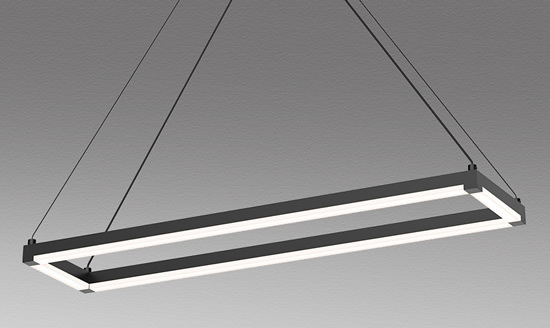 Offered in 38" which includes two 39 watt high output T5 linear Fluorescent lamps or 2600 lumen, 3000K linear LED strips and 49" which includes two 54 watt high output T5 linear Fluorescent lamps or 3500 lumen, 3000K linear LED strips. Has a maximum drop length of 6 feet.